"Simple, Durable & Fashionable! 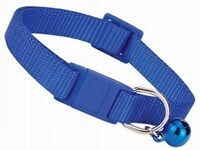 Nylon Cat Collars feature a simple yet fashionable design that is sure to have tremendous appeal. 3/8"" wide collars adjust to fit necks 8""-12"" and feature a color coordinated jingle bell for location awareness."